You and your fetus will be carefully monitored for signs of distress or shock . If you or your fetus are in danger, an emergency cesarean section will be done. If you and your fetus are at low risk of problems and your fetus is full-term, then you may deliver vaginally . 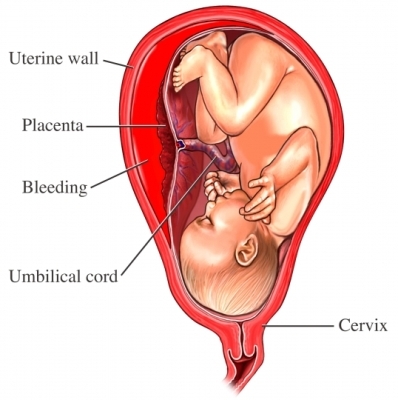 Bleeding in pregnancy, placenta previa, placental abruption. Stanford Children's Health website. Available at: http://www.stanfordchildrens.org/en/topic/default?id=bleeding-in-pregnancyplacenta-previaplacental-abruption-90-P02437. Accessed August 8, 2018. Placental abruption: Abruptio placentae. American Pregnancy Association website. Available at: http://americanpregnancy.org/pregnancy-complications/placental-abruption. Updated May 2, 2017. Accessed August 8, 2018.